Time once again to head off to the AECC in Aberdeen, though snow on my car and icy wind reduce the appeal of the early start. Dropping by the office first at 0615 also helped get me in the mood. So, how will the oil & gas sector get stronger and more resilient? 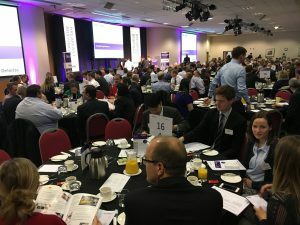 It seems a cooked breakfast is a decent start and a chance to chat with folks on my table, including Operators Marathon and Premier Oil, along with Exova – the materials testing specialists. Supply chain people very much in evidence. Usual format, respected speakers and an opportunity to network. Attendance was good and plenty of senior industry people willing to discuss things. Speakers this time came from Rolls-Royce Marine, Nexen, Deloitte and Bibby Offshore. Good to get the perspective of Rolls-Royce as the Marine business has under intense economic pressure, much like the oil & gas sector. Repeated restructuring, cutbacks, layoffs and new goals have had many negative consequences but were done to ensure survival. A common thread was that not enough forward thinking was done in the good times, forcing major business process reviews recently and a need for investment in working smarter and bringing through new technologies. The Rolls Marine division was turning over about £2bn in 2013 with plans for £6bn by 2020. Things changed hugely so is now around £1bn and loss-making. Redundancy levels hit 25% forcing people to perform multiple roles, but the ship is turning, quite literally. Rob Anthony of RR Marine acknowledged that the business has moved from a few huge orders to many smaller bids. That takes effort and must be done with fewer people. That new reality has to be accepted and embraced fast. I see my fair share of tenders so appreciate that in the right conditions things can be different but still fair, save money, deliver greater value and speed things up. It’s about being pragmatic. This reflects what many of us see every day, people taking a fresh look at how business is performed and stripping it back to essentials and automating as much as possible. Refined processes don’t always need technology but it sure can help in many cases. I took away the thought that the resilience and strength will come from a fresh take on running day-to-day business activities from the big to the small. This will allow anti-inflationary methods that will keep cost under control by running smarter and leaner. To get there needs a number of interventions, changing how people think & behave – supporting that with practical and appropriate technology. Based on current market conditions the oil price is unlikely to shift high any time soon so it is vital to redesign some fundamentals in order to prosper, and indeed grow bigger and stronger by incorporating those businesses that didn’t adapt. Microsoft Windows 10 – a great experience for flexible working in the public sector!